As I said in my last post, I was pretty fired up on my chances to get a second deer on my friend’s land last weekend. So, Friday afternoon, I rented a “practical” Scion xB, threw my gear in the back and drove three hours north into the boonies. Arriving at 11pm, extensive scouting really wasn’t an option, but if the deer were as populous and aggressive as they’d been on the land historically, I’d have a full icebox in no time. The nicest part about sleeping at the actual site of the hunt was being able to wake up at 5am and still being able to get into position long before the first trace of sun. 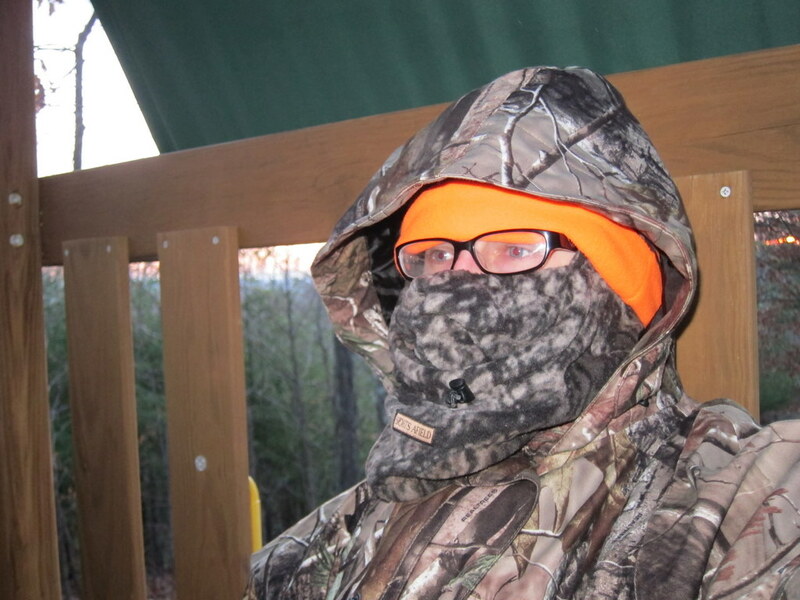 A five sharp, I showered with a “Scent Eliminator,” put on my mostly odorless hunting clothes, and stepped out into the freezing cold, pre-dawn air. 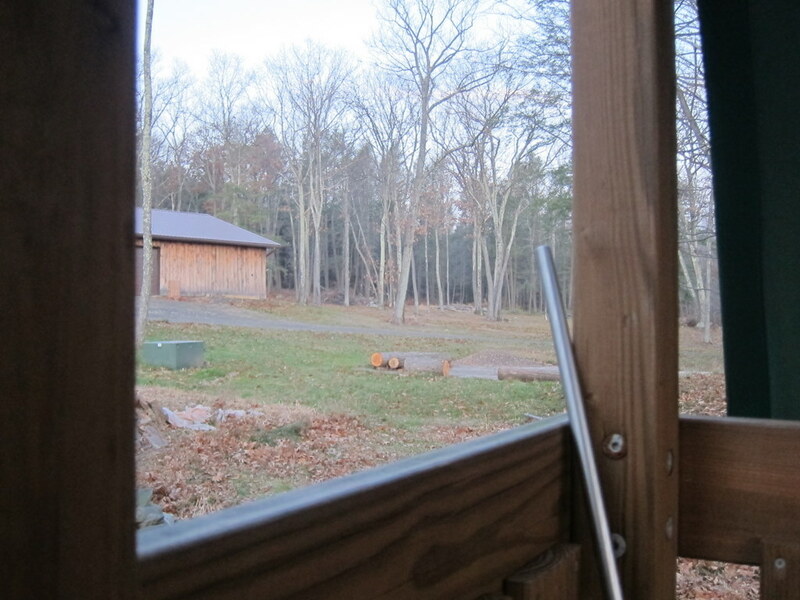 His property was quite modest in size, roughly a 400×150 yard rectangle with inhabited buildings concentrated on one edge, a small food plot nearby, and fairly thick forest covering the rest of the property. The first thing I did when I got outside was check the wind direction; I knew that my scent discipline wasn’t nearly good enough to try for any position other than dead downwind. Fortunately, the wind was fairly steady in velocity and direction. The direction of the wind suggested that I take a position close to the northeast corner of the property. Fortunately for me, there was a kid’s wooden jungle gym lodge about 8 feet off the ground, with an excellent vantage point of a clearing and treeline upwind. 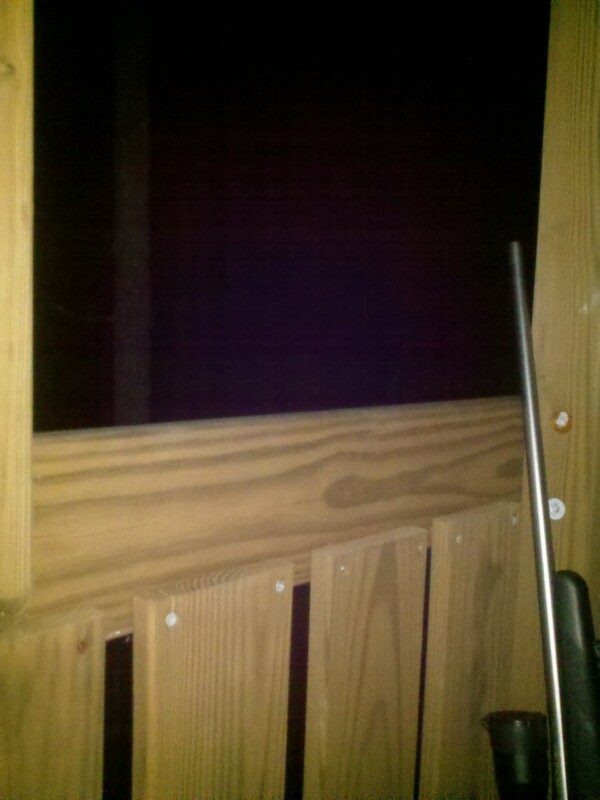 Also, it was still very dark, so attempting to scout in the woods for a better spot would have been pretty foolhardy. So, I climbed into the ersatz Tree Stand and got settled in. Two of those in my outer pockets meant the difference between a nippy few hours and my fingers turning into 10 useless fingersickles. The archery glove-mittens I bought are NOT adequate for <20 degree weather without hand warmers. Live and learn. My tool this year was my Tikka T3 chambered in 7 Remington Magnum topped with a Zeiss Conquest 4.5×14. I use Remington Managed Recoil ammo, as the additional velocity of full-house 7RM isn’t needed on 100 yard whitetail. Fourty-five minutes before sunrise, when I could barely make out the outline of distance objects, the first rifle shots rang out from distant hunters. I consider myself to be a pretty law-abiding person, but at the same time, victimless crimes committed by other people don't really bother me much. Had these slob hunters used a suppressed rifle, crossbow, or bow, and dropped their animals, while I wouldn't do the same, I wouldn't begrudge them much. An unsuppressed rifle shot, however, basically alerts game for at least a mile, "Hey Bambi, we're coming to get you." Not cool. Saw almost zero activity. Around sunrise, I heard some loud-ish rustling sounds coming from behind me. Unfortunately, about 20 ft behind me was very heavy brush, basically obscuring any movement as well as diffusing the sound. I still don’t know if that was a deer, but it strikes me as fairly likely. Regardless, I was dead upwind from it, so it probably got spooked and bugged out. At around 7:45am, my friend’s kids were up and walking the dog, so I figured it was time to pack it up for the morning. After a delicious breakfast, I went scouting with my friend’s older kids (10, 8, and 6) who knew where were were likely to find sign in the woods. The oldest, who knew the property fairly well, said that the deer really enter the open area in warmer weather, so my best shot would be in the woods. I figured my best chance now would be to find a seriously worked scrape, rub, trail, fresh sign, or some other indications a path was “hot.” We hiked almost an hour, finding a great deer trail leading to a small creek with several fresh hoof prints. Unfortunately, I soon ascertained that we totally off my friend’s property… thank goodness for hunter orange hats, amiright? After we finished, I got ready to hunt the sunset. By afternoon, the winds had shifted, now they were moving towards the northwest. I went out at about 3:00pm, to both scout and find a place to settle down for sunset. Unfortunately, I didn’t find any obvious sign on the property on the way to a position. Using my GPS, I found the pin denoting the northwest corner of the property, I found a tree with decent shooting lanes looking south southeast, I sat down and waited for an unwary deer to cross my path. Once again, I was outsmarted. Several tremendous gusts coming from 180 degrees of the main wind blew my scent towards by shooting lanes, probably spooking every deer for at least a quarter-mile. Amazingly, I saw nary a squirrel, chipmunk, or hare, despite plenty of acorns and other edible items littering the forest floor. Finally, when I couldn’t see much, I packed it up. Thank you Cellphone GPS and LED flashlight…made finding the house much easier in darkness. Over dinner my friend’s 6-year-old daughter ceaselessly quizzed me about hunting Bear and asked very graphic questions. I was pretty amused, his kids will grow up with the outdoors in their blood. After dinner, I talked my friend and his wife into firing up a Finnish sauna (complete with a firewood burning stone imported from Finland). Although we didn’t have an icy lake to jump in, it still felt great after a day of running around in the woods. Having gotten only about three and half hours of sleep the night prior, I got ready for an early hunt the next day and promptly passed out.